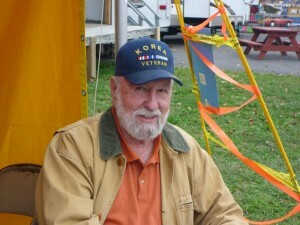 Korean Vet and co chair of the event, Charlie Geers is shown selling tickets for the dinner. All Saints Episcopal Church, Fulton is having a Spaghetti Dinner on Veterans Day, Sunday, November 11, 2012. Tickets are: Veterans – $4.50, Pre sale/ Seniors – $6.00, at the door – $7.00 and children under 12 yrs – $3.50. The dinner will be served from noon to 5:00 pm in the church parish hall on the corner of Academy St and S. First St., Fulton. All profits will go to church maintenance and outreach, including Tuesday Night Community Dinners, which has served thousands of free dinners to Fultonians for nearly four years. A raffle will be held for a number of exquisite homemade items.